Cast of Forget About It! Congratulations, and thank you to everyone who auditioned! Auditions for Forget About It! 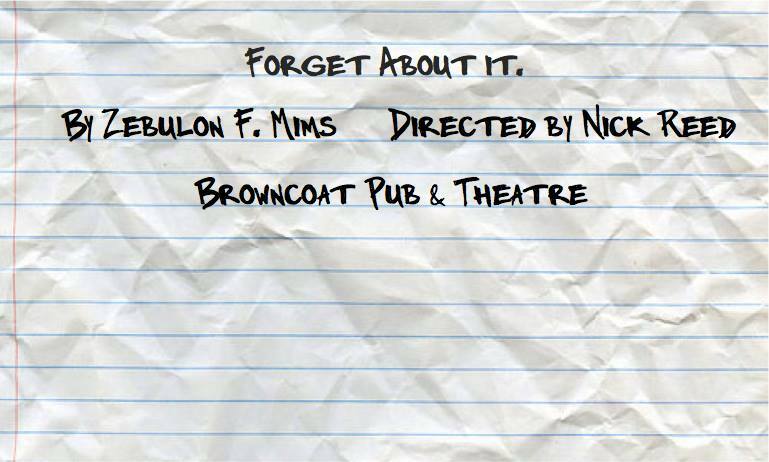 Coming up, we have auditions for Forget About It! Follow the link to get more information! Auditions will be on Monday, June 9th and Tuesday, June 10th from 7:00 pm until 10:00 pm, at the Hannah S. Block Community Arts Center (120 2nd Street). Show dates are July 10-13 and 17-20. Daniel- Plainspoken, but firm when something is important to him. Prone to mood swings. Linda- Very intelligent, and wants everybody to know it. Confident, secretly oversexed. Molly- Beautiful in a cute and innocent sort of way. Avoids confrontation when she can. Genuinely kind and selfless. Walk in auditions are welcome, but it would be preferred for you to contact the stage manager and schedule an audition time. Contact Naomi at (919)632- 4292 or nlb8789@uncw.edu.